Go from village to village, do good to humanity and to the world at large. Go to hell yourself to buy salvation for others... ‘when death is so certain, it is better to die for a good cause’. What is the purpose of life? Any man who thoughtfully evaluates this question will discover that it is well-nigh impossible to answer this question meaningfully as long as one remains convinced that this short life – 70 years or more – the Indian average – is the be all and end-all of existence. Such a life – devoid of purpose – other than merely eating, sleeping, gaining a little, losing a little – with its short lived joys and sorrows – cannot be the sustenance of any great thought or work. On the other hand – a view of life that assumes man to be on an infinite, evolutionary journey from the Centre back to the Centre – is one that invests every act with significance, every role with profundity, every word with meaning. It is from this standpoint – that man is a continuously growing, evolving, being who is constantly seeking, often without realizing it, a higher state with purer attributes and greater capabilities to do universal good – that we must understand the idea of service. Service then becomes an instrument of personal growth, an instrument that will enable man to continuously decide between two fundamental choices – the good of oneself and good of all. This choice – me or All – is the central question that must be answered in our quest for the Infinite. If it is me, then, here I am, condemned to continual transactions with the rest of the universe – restricted at every stage by forces that will prove to us how small and limited any one being is. On the other hand, if it is All, then I am ready at every stage, to stand up and declare, do not fight this petty being, do not restrict this finite being, for this being is ready, at every stage, to be offered at the Altar of Universal Good. Suddenly, this limited human body, carries within itself an unlimited idea – the idea of Universal Good – and there are, from now on, no more restrictions – no, mind you, mental restrictions, no emotional restrictions, no artificial restrictions laid down by a mind that calculates the profit or loss of each venture, each undertaking. There will still be physical restrictions of the world that will exist, but they are not obstructions which cannot be surmounted with a good fight. Such a human being, unrestricted within, ready always to be offered for Universal Happiness, is a veritable powerhouse. All of this human being’s diverse energies are now directed and focused on the single idea of Universal Good. And from this focus will flow tremendous sincerity, clarity of thought, and most important, honesty of purpose. This honesty of purpose, in turn, will sweep away most of the weapons that the physical world uses to bind a human being – wealth, power, fame, the prospects of comfort, the feelings of achievement. The human being is now truly powerful, and the world truly powerless. It is this human being that must go out and rouse this nation. Fight in its schools, its hospitals, its fields, and its villages. 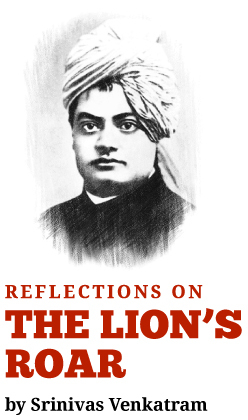 It is this human being that Swami Vivekananda asks for and to whom he exhorts, “Stop not till the goal is reached”.